Everyone learns differently, and when it comes to teaching primary school kids, you have the added challenge of them being constantly distracted and full of energy. No matter who you are or where you come from, there is a way to get through to everyone, so be creative with your educational resources if you hope to create a truly diverse, positive and effective learning environment. The following are some great creative educational resources that can have you discovering the perfect way to get those crucial lessons across. Places like museums and science centres are amazing educational resources, so getting the kids out on field trips is a great way to get their attention and teach them about important topics like history, science and technology. Sometimes just having the kids off school grounds can be enough to shift a stagnant classroom dynamic, making it absolutely crucial that they get out of the classroom bubble once in a while. 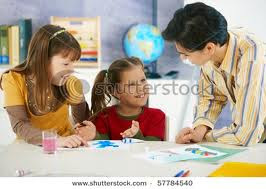 If you really want an important lesson to stick, bringing in a special guest is a great move, as sometimes it can help to have another adult back you up on a lesson. Obviously if this person is a celebrity, the kids will believe anything they say, though regardless of their fame or lack of it, a new face can be just the thing to get through to primary school children. Special guests can often end up being very inspirational for the kids, so try and include at least one in your plans for the term. Primary school kids have amazing imaginations, so for a great way to tap into their world, books can prove to be one of the most effective educational resources around. There are a lot of books out there for every level of reading ability, so if you want to find a creative way to get the class to learn a big lesson, assign them a book that deals with the issue, and then discuss it as a class. Food is something that we all have in common, and teaching children to grow, prepare, cook and eat food together can be a great way to teach them about health, nutrition, agriculture, the environment, and a whole host of other topics. You can even invite someone from a local restaurant or bakery to come in and do a half-day hospitality training with the kids, with everyone able to take home all the tasty treats they make. It will be a guaranteed highlight of the semester. Art is something that all primary school aged kids should be encouraged to do regularly, and is can also be a really effective medium to learn wider non-art related lessons such as sharing, teamwork, leadership, etc. So for teachers who feel comfortable being arty, using art as an educational resource can be a great way to have a fun class where everyone takes home some important lessons, along with their beautiful creations. No matter what you try, it is important that you use a diverse range of educational resources if you hope to be doing your job effectively and actually teaching the kids something. Variety really is the spice of life, so mix things up and your students will come excited to learn something new each day.